Does this feel like you’ve stepped into an alternate reality when you open the Wall St. Journal and the top 2 stories on the Marketplace page are “Microsoft Profit Skids 29%” and “Ford Navigates Path to Profitability”? Gotta love the automotive analogy with “skids” vs. “navigates”. BTW – I haven’t checked the historical quarterly data, but I don’t think a quarterly loss on OS right before a new version of Windows comes out is unusual (although 29% may be high). This is the time of the highest expenses (as all hands are on deck for development and marketing expenses are gearing up) and lowest revenue (as buyers hold off until the new version). Same goes for Office (down 13%) right before the new version of Office 2010 comes out in the first half of 2010. Still, Microsoft’s expectations were off. Online you can see the stories, although not the comparative “skids” vs. “navigates” in the titles and telling downward red arrows for Microsoft and a green bar for Ford. Here’s the link (but it’s only good for today, Friday 7/24/09 since it updates the the current day’s headlines each day). This is a quick apology to readers of my blog who have had poor response or enormous content on the first page recently. I’ve been doing backups of my blog and my process results in temporary content overload for readers. For those with a WordPress blog that want to create a usable backup for archival or re-use purposes (like copy/pasting into documents or creating a book), here’s how I’ve done it. First, ignore the convenient “Tools, Export” option unless you’re an XML jockey or have found a ready-made tool or schema that can utilize a WordPress WXR file. I looked and couldn’t find an easy way to consume this file. From your admin dashboard, go to Settings, Reading. Set it to show 1000 blog posts (or however many is needed to cover all your posts), show full text for each article, and select the categories you want to show. Then save the changes and view your blog. Now you have everything you’ve written in one big, long web page. Copy paste it into a text editor or Word, or just use “save as web page complete” from your browser. Also note you can click on one category to create an extract of everything you’ve written on one subject if you’re using categories. Just an example of the fun you can have repurposing your blog. I’m sure the same type of process would work for other blogging systems as well like TypePad or Blogger. I wrote a blog posting over at the Collaboration and Content Strategies blog that answered the Global Watchtower’s pronouncement of “companies claiming that ‘it just isn’t worth it’ to have websites in other languages.” My response is that I suspect this is due to tighter economic conditions that require harder business cases coming up against web localization efforts that have easily quantified costs but benefits that are difficult to measure. If you want more detail, you can read that blog post here. 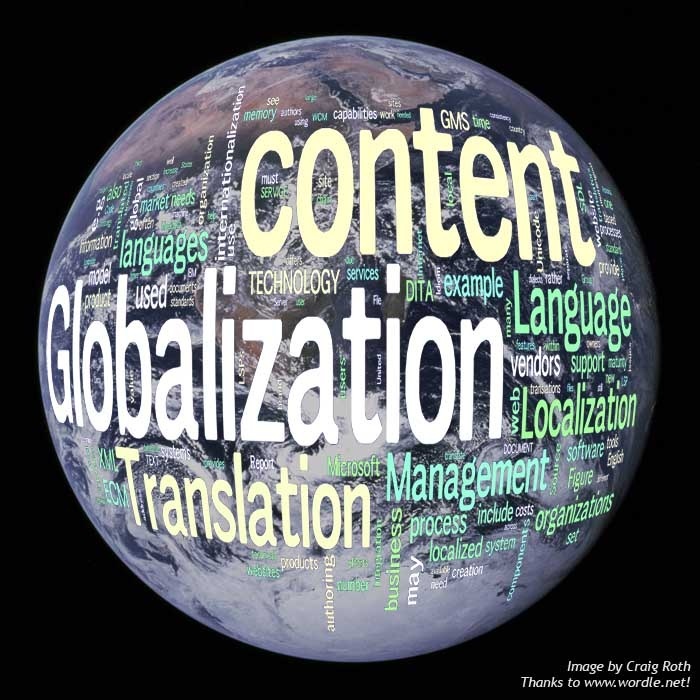 What I want to do here is provide this Wordle chart of my report “ECM for Translation and Localization: Raising IT’s Globalization Fluency“. This report is only available to clients, but I can boil down all 45 pages of it into one handy chart on “content globalization”. It’s like getting your knowledge in capsule form! Click for a larger view. I was speaking recently with a client who has three portals in house (IBM, SAP, and Microsoft) and was asking how normal that is and how to integrate them. This is a very common question as well as very common combo of portals. My advice continues to be the same. It’s perfectly normal for a large organization to have several portal products around. 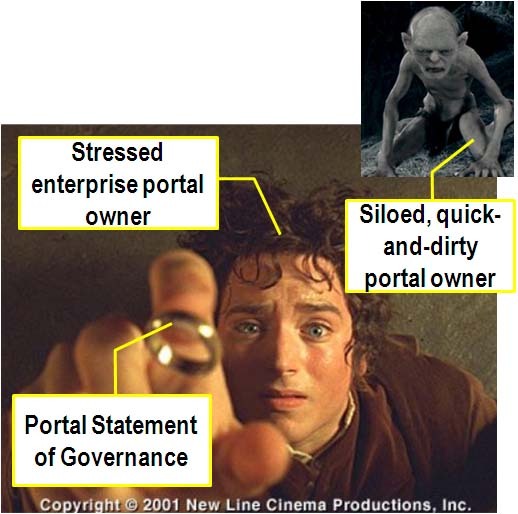 What is best (if possible) is to anoint one as the “enterprise portal” that acts as an umbrella above the others and then strictly define the roles of the other portals using governance. This rationalizes the role of the other portals and makes sure people know where they should be posting and looking for information. Certainly having a common search engine that can go across all the portals to find content is helpful, but you don’t want to use that as a crutch for lack of governance. When you have multiple portals, integration is best handled by selecting separate, third party products for supporting services (e.g., web content management, collaboration rooms) if they will need to be exposed across all the portals, and use web services as an integration mechanism, although portal standards like WSRP may help. and in the darkness integrate them using web services and emerging portal standards. OK, so I’m not a poet. I just blogged the other day about vendor conferences. While it was written after going to a an IBM Lotusphere event, the issue was a more general one about whether conferences should preach to the converted or try to win over new converts. There are actually many such decisions that need to be made when a vendor (or analyst firm or independent conference committee) designs a conference. So, I decided to put together a list of the tradeoffs that need to be decided. There’s no right and wrong here. Vendors have to be profitable and want to get their message across, and attendees need to watch expenses but want to learn in an enjoyable atmosphere. 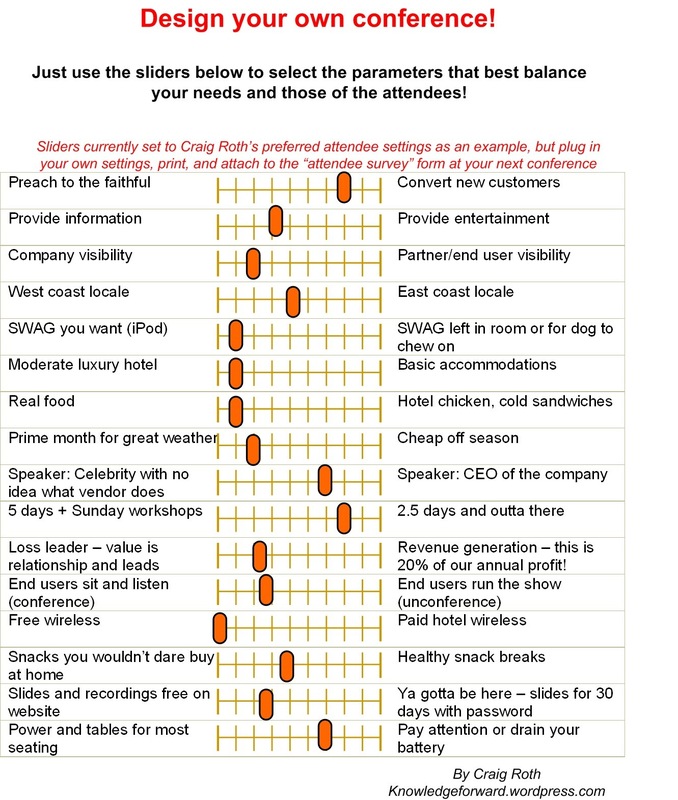 I’ve attached a handy “design your own conference!” guide that includes my default positions for where I’d put the sliders if I’m attending a vendor conference. I go to a lot of different conferences as attendee and speaker so my view may be skewed a bit. Let me know what you think! Peter O’Kelly’s blog pointed me to a Productivity Future Vision video from Microsoft Office Labs. Highly recommended. Airline seats in the future will be wider and have more legroom, even when you aren’t in first class (the seats on the plane don’t look like big, puffy, overwrought first class seats). Furthermore, they will be clean and not have potato chips from the previous occupant smeared on them. People will use their electronics calmly and be nice to each other. People in the video seem to calmly make a few gestures, then relax and smile. It seems that productivity expectations in the future have remained about constant with today rather than increasing along with the improvement in the capabilities of their applications. The time saved through their more productive interfaces has been returned to the worker to allow them to stop and smell the roses instead of their employers and clients demanding more from them. This will allow people in the future to relax and use their new wondrous equipment in serene happiness. Devices get thinner and more translucent. But while you may think holding remotes that are as thin as a piece of glass and typing on hard, flat surfaces would be uncomfortable, they will actually be pleasantly ergonomic because people in the future will have dainty hands and features. There seem to be no obese, elderly, overly tall, or overly short future workers. There is no need for paper in the future, so working environments remain clean and clutter free. Come to think of it, there seems to be no need for food, conference SWAG, books, printers, or desk lights either. This explains the lack of garbage cans in the rooms shown in the video. Office workers will not create content anymore, such as typing long streams of text or slaving over the graphics in the beautiful interfaces they use. They simply do a few manipulations to content that already exists. Presumably a new underclass of information workers (I’ll call them “information morlocks“) slave away underground crafting detailed content that the surface dwellers can then use through simple, intuitive, tap-exhale-and-smile interfaces. I like the thought leadership I see here. The basis for some truly wonderous technology exists today, such as the machine translation, digital ink, mobile phone projectors, and OLED displays shown in the video. Interfaces with touch and gestures can be much more natural than keyboards and mice. Collaborative workspaces can be made more natural and incorporate many other useful technologies. I want to see content that is created in easy-to-use tools that scale to the needs of the user and produce content that is easily componentized, tagged, reused, and reassembled. I want to see contextual meaning to be captured and guidance provided through integrated ontology and machine memory during authoring to enable better translation and localization. I’d like to see powerful and consistent reviewing and commenting features across all productivity tools that can discover implicit collaborative authoring processes through observation. I’d like to see rich presence information that improves productivity by inserting routing and channel switching to messages that determine the most appropriate way to deliver a message while taking both sender’s and receiver’s contextual preferences into account. I’d like to see operating systems and productivity applications working together to create more interruptable environments that fit the time sliced, interruptable nature of the workplace. They would allow better bookmarking that can save retrieve the exact state of applications and their relations to each other, easing the burden of remembering what activities were in motion during interruptions and reducing time to resuming work. Snapshots of window layouts and application states would allow easy, instantaneous switching between multiple workstreams. I’d like to see wearable electronics that utilize personal rich presence, mobile technology, and social networking profiles to alert people to others in their vicinity that share interests (or other programmable searches) and are open to serendipitous conversation. The statement is so one-sided in its application that I would be curious how many judges and juries have knocked it down over the years. The shame is that this kind of phrase acts as a landmine – it can sit there quietly for years, but then explode one day if the company decides to reuse some IP that the original poster (who probably didn’t read the long legal disclaimers) didn’t even think could be reused. One company probably used this phrase first and other lawyers loved it so much they all copied it. In fact FindLaw publishes it as a sample to be used by others. Great- spread the joy. I don’t know who the original lawyer is that came up with that phrasing, but he can’t complain about all the copying since his client probably had an irrevocable, perpetual, non-exclusive, transferable, fully paid, worldwide license to use it. 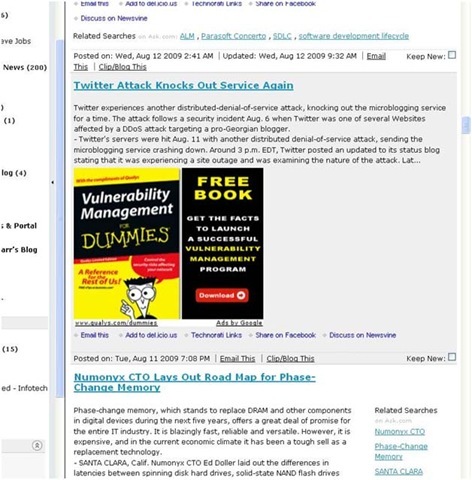 "Two Executives Trampled, One Gored Due to Craig Roth Article: Film at 11"
Social Computing Magazine has published my article The Elephant in the Social Software Room, which I posted in this blog last week. The theme of the article is that there is a business issue that is unspoken but impacts decisions about adoption of social software: to what degree do organizational structure and gatekeeper processes serve a positive purpose? The truth is that many suspect they know the answer, but no one really does. Assumptions that there is value to the structure drives the amount of risk that executives worry about when technology helps employees circumvent these structures and processes. Perception that the structure doesn’t always have value is what drives employees to look for mechanisms to get around the artificial walls and bureaucratic processes. 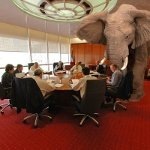 The part I really like is that Social Computing picked up on the analogy and inserted a picture of an elephant in a boardroom to illustrate the concept. I sincerely hope that no executives were trampled during this photo shoot, however worthwhile the issue at stake is. I hope you have been enjoying my blog postings, but I believe there is always room for improvement. Therefore, in a constant quest to improve the quality of my communications, I have turned to the doyenne of etiquette, Emily Post. The original 1922 text of her book “ETIQUETTE IN SOCIETY, IN BUSINESS, IN POLITICS AND AT HOME” is available on Gutenberg.net. A simple find&replace of “letter” with “blog posting” resulted in some sage advice that I intend to follow from now on. In writing notes or blog postings, as in all other forms of social observance, the highest achievement is in giving the appearance of simplicity, naturalness and force. Those who use long periods of flowered prolixity and pretentious phrases—who write in complicated form with meaningless flourishes, do not make an impression of elegance and erudition upon their readers, but flaunt instead unmistakable evidence of vainglory and ignorance. The blog posting you write, whether you realize it or not, is always a mirror which reflects your appearance, taste and character. A “sloppy” blog posting with the writing all pouring into one corner of the page, badly worded, badly spelled, and with unmatched CSS themes—even possibly a blot—proclaims the sort of person who would have unkempt hair, unclean linen and broken shoe laces; just as a neat, precise, evenly written note portrays a person of like characteristics. Therefore, while it can not be said with literal accuracy that one may read the future of a person by study of his writing, it is true that if a young man wishes to choose a wife in whose daily life he is sure always to find the unfinished task, the untidy mind and the syncopated housekeeping, he may do it quite simply by selecting her from her blog postings.